امگا-3 یکی از اسیدهایی است که در ساختمان برخی چربی‌ها وجودداشته و در سلامت انسان نقش ضروری ایفا می‌کند. لذا تحقیق‌های گسترده‌ای به‌منظور تغلیظ و خالص‌سازی امگا-3 از روغن ماهی انجام گرفته است. در این پژوهش، به بررسی کارایی فرایند غشایی در تغلیظ اسیدهای چرب امگا-3 بلندزنجیر موجود در فانوس ماهی که حاوی 25/23 درصد امگا-3 بوده، پرداخته شده است. به‌منظور ساخت غشاء، از پلیمر ELVALOY®4170 استفاده شد و غشاء به روش ترسیب به‌واسطۀ غوطه‌وری تهیه شد. ساختار غشای حاصله ازطریق میکروسکوپ الکترونی روبشی موردارزیابی قرار گرفت. در فرایند تغلیظ، اثرات 3 پارامتر شامل دمای فرایند، فشار و نرخ هم‌زدن به روش آماری سطح پاسخ Box-Behnken موردمطالعه قرار گرفتند. تصاویر میکروسکوپ الکترونی غشاء نشان داد غشای حاصله متشکل از ساختاری متخلخل به همراه یک لایۀ فوقانی چگال بسیار نازک بوده است. نتایج به‌دست‌آمده از آزمون تغلیظ به روش آنالیز واریانس موردارزیابی قرار گرفت و نشان داد که در بین پارامترهای موردبررسی، دما از بیشترین تأثیر در فرایند تغلیظ برخوردار بوده است. علاوه‌بر این، رفتار گرفتگی غشاها در دور هم‌زدن‌های مختلف موردبررسی قرار گرفت و نتایج نشان داد که کمترین گرفتگی در حالت هم‌زدن برابر با 100 دور در دقیقه اتفاق افتاد. در بین شرایط مختلف فرایند تغلیظ، بیشترین تغلیظ امگا-3 در دمای 40 درجۀ سلسیوس، فشار 5 بار و شدت هم‌زدن صفر و برابر با 37/32 درصد وزنی بود. Abedini, R., Mousavi, S.M., & Aminzadeh, R. 2012. Effect of sonochemical synthesized TiO2 nanoparticles and coagulation bath temperature on morphology, thermal stability and pure water flux of asymmetric cellulose acetate nanocomposite membranes prepared via phase inversion method. Chemical Industry & Chemical Engineering Quarterly, 18(3):385-398. Abedini, R., Mousavi, S.M., & Aminzadeh, R. 2011. A novel cellulose acetate (CA) membrane using TiO2 nanoparticles: Preparation, characterization and permeation study. Desalination, 277(1-3):40-45. AOCS. 2009. Animal and vegetable fats and oils–Determination of Oils and Fats, Gas chromatography. No Ce 1h-05. Azmi, R.A., Goh, P.S., Ismail, A.F., Lau, W.J., Ng, B.C., Othman, N.H., Noor, A.M., & Yusoff, M.S.A. 2015. Deacidification of crude palm oil using PVA-crosslinked PVDF Membrane. Journal of Food Enginnering, 166:165-173. Chen, Y.Q., Edwards, I.J., Kridel, S.J., Thornburg, T., & Berquin, I.M. 2007. Dietary fat'gene interaction in cancer. Cancer Metastasis Reviews, 26(3-4):535-551. Field, R.W., & Wu, J.J. 2011. Modelling of permeability loss in membrane filtration: re-examination of fundamental fouling equations and their link to critical flux. Desalination, 283:68-74. Hibino, M., Sumi, A., & Hatta, I. 1995. Atomic images of saturated and unsaturated fatty acids at liquid/graphite interface and difference of tunneling currents between them observed by scanning tunneling microscopy. Japanese Journal of Applied physics, 34(1):610-619. James, B.J., Jing, Y., & Chen, X.D. 2003. Membrane fouling during filtration of milk-a microstructural study. Journal of Food Engineering, 60(4):431-437. Juang, R.S., Chen, H.L., & Chen, Y.S. 2008. Membrane fouling and resistance analysis in dead-end ultrafiltration of bacillus subtilis fermentation broths. Separation and Purification Technology, 63(3):531-538. Kolanowski, W., Jaworska, D., & Weissbrodt, J. 2007. Importance of instrumental and sensory analysis in the assessment of oxidative deterioration of omega-3 long-chain polyunsaturated fatty acid-rich foods. Journal of the Science of Food and Agriculture, 87(2):181-191. Kolanowski, W., & Laufenberg, G. 2006. Enrichment of food products with polyunsaturated fatty acids by fish oil addition. European Food Research and Technology, 222(3-4):472-477. Kumar, N.S.K., & Bhowmick, D.N. 2006. Separation of fatty acids/triacylglycerol by membranes. Journal of the American Oil Chemists' Society, 73(3):399-401. Letisse, M., Rozieres, M., Hiol, A., Sergent, M., & Comeau, L. 2006. Enrichment of EPA and DHA from sardine by supercritical fluid extraction without organic modifier: i. optimization of extraction conditions. The Journal of Supercritical Fluids, 38(1):27-36. Mehrparvar, A., & Rahimpour, A. 2015. Surface modification of novel polyether sulfone amide (PESA) ultrafiltration membranes by grafting hydrophilic monomers. Journal of Industrial and Engineering Chemistry, 28:359-368. Metcalfe, L.D, Schmitz, A.A., & Pelka, J.R. 1966. Rapid preparation of fatty acid esters from lipid for gas chromatography analysis. Analytical Chemistry, 38(3):514-515. Gamez-Meza, N., Noriega-Rodriguez, J.A., Medina-Juarez, L.A., & Angulo-Guerrero, O.2003. Concentration of EPA and DHA from fish oil by hydrolysis and urea complexation. Food Research International, 36(7):721-727. 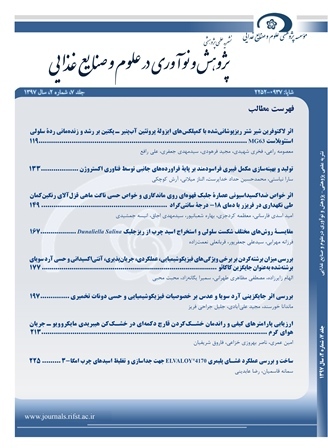 Nourbakhsh, H., Emam-Djomeh, Z., Mirsaeedghazi, H., Omid, M., & Moieni, S. 2014. Study of different fouling mechanisms during membrane clarification of red plum juice. International Journal of Food Science & Technology, 49(1):58-64. Rodriguez, N.R., Beltran, S., Jaime, I., de Diego, S.M., Sanz, M.T., & Carballido, J.R. 2010. Production of omega-3 polyunsaturated fatty acid concentrates: a review. Innovative Food Science & Emerging Technologies, 11(1):1-12. Ranjbaran, F., Omidkhah, M.R., & Ebadi Amooghin, A. 2015. The novel Elvaloy4170/functionalized multi-walled carbon nanotubes mixed matrix membranes: fabrication, characterization and gas separation study. Journal of the Taiwan Institute of Chemical Engineers, 49:220-228. Rupasinghe, H.P.V, Erkan, N., & Yasmin, A. 2010. Antioxidant protection of eicosapentaenoic acid and fish oil oxidation by polyphenolic-enriched apple skin extract. Journal of Agricultural and Food Chemistry, 58(2):1233-1239. Ruxton, C.H.S., Calder, P.C., Reed, S.C., & Simpson, M.J.A. 2005. The impact of longchain n-3 polyunsaturated fatty acids on human health. Nutrition Research Reviews, 18(1):113-129. Saljoughi, E., Amirilargani, M., & Mohammadi, T. 2009. Effect of poly (vinyl pyrrolidone) concentration and coagulation bath temperature on the morphology, permeability, and thermal stability of asymmetric cellulose acetate membranes. Journal of Applied Polymer Science, 111(5):2537-2544. Shahidi, F. 2005. Bailey' Industrial Oil and Fat Products. Wiley and Sons, New York. Sotoft, L.F., Lizarazu, J.M., Parjikolaei, B.R., Karring, H., & Christensen, K.V. 2015. Membrane fractionation of herring marinade for separation and recovery of fats, proteins, amino acids, salt, acetic acid and water. Journal of Food Enginnering, 158:39-47. Wu, L., Yick, K.L., Ng, S.P., & Yip, J. 2012. Application of the box-behnken design to the optimization of process parameters in foam cup molding. Expert Systems with Applications, 39(9):8059-8065. Yesudhason, P., Gopal, T.K., Ravishankar, C.N., Lalitha, K.V., & Kumar, K.N. 2009. Effect of modified atmosphere packaging on chemical, textural, microbiological and sensory quality of seer fish (scomberomorus commerson) steaks packaged in thermoformed trays at 0-2ºC. Journal of Food Processing and Preservation, 33(6):777-797.